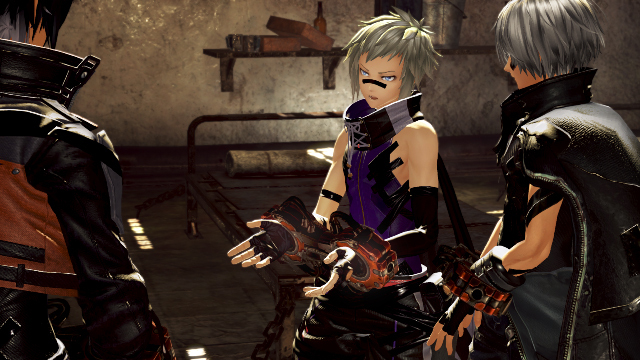 God Eater has been one of my personal favorite series in recent years. It may have been described as an anime-style Monster Hunter by some, but God Eater has a few strong points that will attract players who prefer fast-paced action and a more elaborate story. It has characters with distinctive designs who will not only accompany you during missions but also have their own expositional developments, making the story far more engaging. 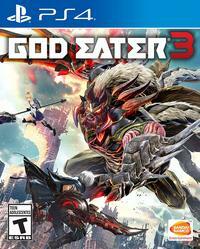 I was very excited when Bandai Namco finally revealed the series' newest sequel in God Eater 3. Although past entries were developed with portable consoles in mind, God Eater 3 is being built entirely from the ground up for home consoles while still keeping both the pseudo and real multiplayer feels intact. PlayStation 4 has become the main platform for this third mainline game, and in place of PlayStation Vita, it will also be released on PC via Steam. Bandai Namco had set up a playable demo build for God Eater 3 during Tokyo Game Show 2018, and I was there to check it out. I was then given 15 minutes to explore the features and missions that are available in the demo. The title God Eater also refers to characters who had their bodies infused with cells that let them fight monsters called Aragami. A distinctive visual cue of God Eaters are the large hand gauntlets which manage the cells so that they do not go out of control. In this new game, there are even stronger characters called Adaptive God Eaters (or AGEs) which wield gauntlets on both hands. These are what your own character and your closest friends in the story will become. Instead of something close to a military force in the past, AGEs are treated more like expendable slaves, with the two gauntlets acting as handcuffs that can only be unlocked remotely by the jailer. You and your friends are even living in a shared prison cell which acts as the 'base camp' in this demo. The cell has a couple of terminals inside that let you choose missions and change your equipment. After speaking with the team leader Hugo after preparations are completed, you will sortie out with him, Zeke, and Claire Victorious, one of the new heroines in this game. While God Eater 3 adds two new melee weapons to the mix - Biting Edge (a pair of short blades that can be combined into a double-edged naginata) and Heavy Moon (a ring blade that can be transformed into a chainsaw axe) - the demo included all the returning weapons including Charge Spear, my personal favorite, which can deal large amounts of damage with pinpoint accuracy. Most gun types (Assault, Sniper, Shotgun) are also returning from previous games, but the Blast Gun has been completely replaced with a new type called the Ray Gun. Although it does inherit all the same features the Blast Gun had previously - including the ability to reserve Oracle ammunition stocks - the Ray Gun lives up to its name as it can continuously shoot a laser that gradually drains Oracle. However, the method of shooting the laser is a bit different than what I expected. All you need to do is just tap the fire button (Square or Triangle) and the laser will light up until you run out of Oracle; to stop it, you just tap the same button once more. Although it does help to give the player more focus to move around and aim with the sticks, I can't help but wonder if there will also be an option to let the laser fire by holding down the button for players who may prefer to have it that way. God Eater 3 also combines older gameplay features with some adjustments to form an even more exciting experience. Imagine the Blood Arts from God Eater 2 (Rage Burst) and Predator Styles from God Eater Resurrection being combined and arranged. While you could only equip one Blood Art in GE2, in GE3 it has been revamped as Burst Arts, and you can now assign three of them separately to a ground attack, aerial attack, and dash attack respectively - similar to how they handled Predator Styles in GE Resurrection. As the name implies, Burst Arts, which modifies the attacks into look more flashy and deal more damage at the same time, can only be used if the character's Burst mode is active. But, thanks to them bringing back some of the Predator attacks that debuted in GE Resurrection like Quick Predator and Aerial Predator, it should be easy enough to maintain your Burst mode by frequently launching Predator attacks on the Aragami. As most Aragami have wide-ranging attacks that try to dispose of your entire party, they will often move frequently around the field. While you will still need to chase them down to end their unrelenting assault, the brand-new feature Dive helps in reducing much of the hassle. You can boost towards the enemy while wielding the shield at your front. You can also perform a shield bash attack; the shield bash damage and stamina consumption will all depend on the size of the shield that is equipped. This game also adds a couple of stat-buffing features: Accel Trigger, which activates once the player has fulfilled certain requirements like hitting a combo finisher or performing a just guard multiple times, and Engage, where you link up with another character to share buffs. The plugin effects for both features can be changed in the preparation terminal before heading out on missions. The demo featured three missions, each hosting different Aragami monsters, and I was able to check out all of them within the allocated time. The first mission pits you against Barbarius, the Aragami which can not only burrow underground but also launch ice attacks. 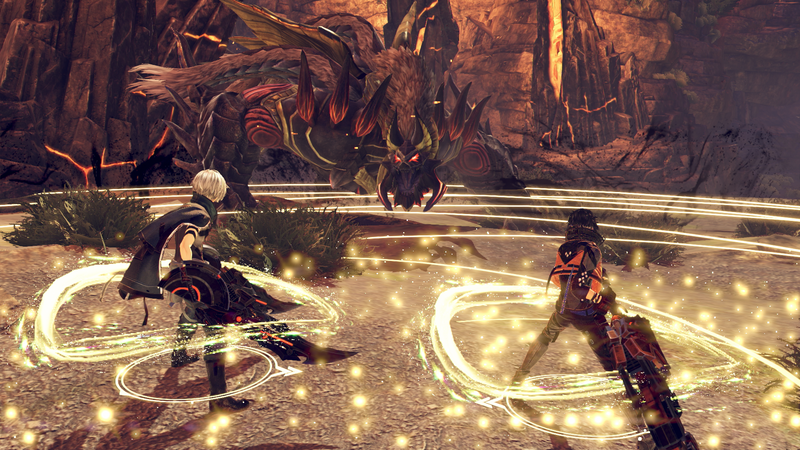 This mission also features a new minor Aragami called Mine Spider which has a trick up its sleeve: It detonates the mines on its back when it is dying, which can and will damage careless players who are still nearby. 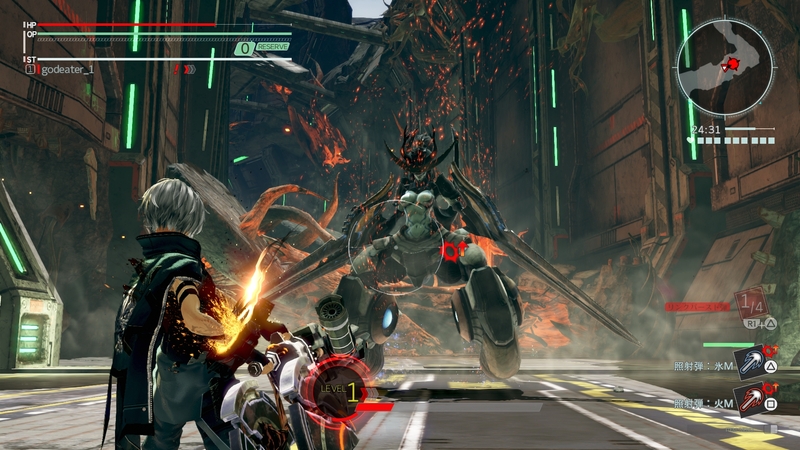 The second mission lets you fight Habakiri, the female futuristic Aragami who, despite being equipped with boosters and long-ranged weapons, has a long recoil time after each of her attacks. This allows players who can avoid her attacks the ability to counterattack. 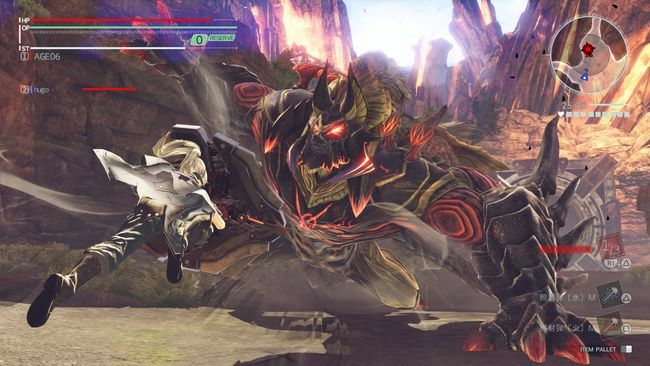 The third and final mission in the demo is the most challenging one as you have to fight against Anubis, which is not only the designated flagship monster of the game but also represents the new Ashborn-type Aragami. The Ashborns are able to launch Predator attacks that will consume energy from their target and cause them to activate the powerful Burst mode. Even if you personally can avoid it, you'll need to pay attention to your allies as the enemy's Burst mode will succeed if the attack hits anyone. The victim hit by Anubis' Predator attack will become significantly hindered for a while; they cannot engage with other characters or even be revived should they get knocked out. Instead, they will be forced to respawn, which brings the team that much closer to failing the mission. Fortunately, Anubis' Burst mode duration can be shortened if players lay into him by frequently landing Predator attacks. Although the developer has changed from Shift (which is now confirmed to be working on Code Vein) to Marvelous' First Studio, all core gameplay systems still feel the same and I could fully apply the knowledge I had gained from prior God Eater games to this demo. 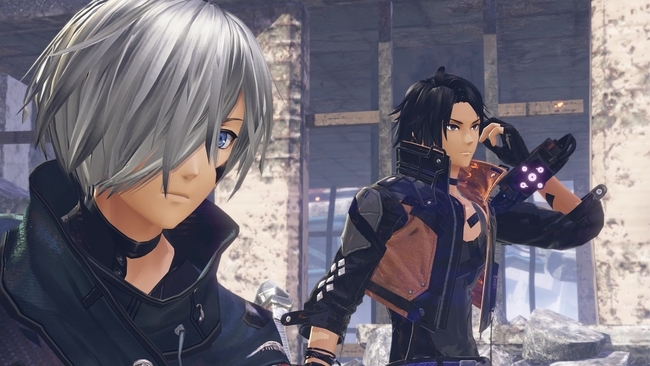 The graphics and character models also definitely feel more refined compared to previous God Eater games as everything is, once again, built from the ground up with the PS4 as the main platform. The constant chatter between allies and the operator, which makes battles far more lively, is of course still intact here. I can't wait to be one of the first to play the full version of God Eater 3 for PlayStation 4 when it launches first in Japan on December 13. The Steam version will arrive later alongside with the international release in early 2019. Enjoyed this article? Share it!